say it louder: UP, right, DOWN, right, UP! I can’t hear you …. UP, right, DOWN, right, UP! 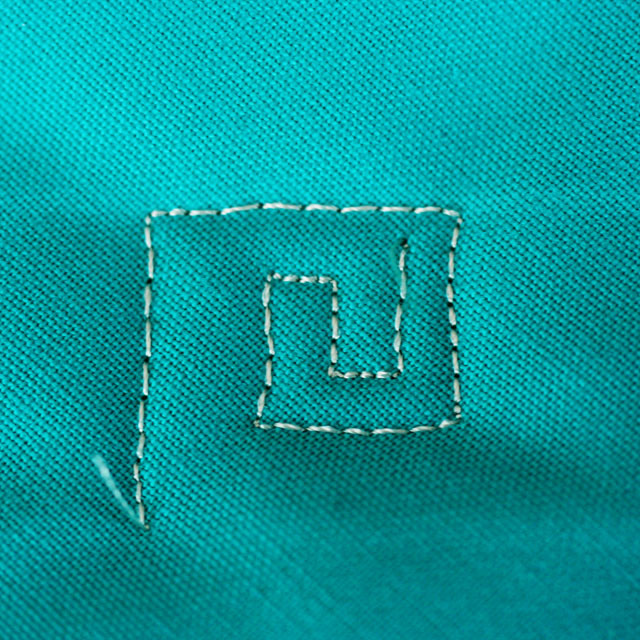 In order to have any chance of stitching this design consistently, you must say that out loud several times before you get started…. 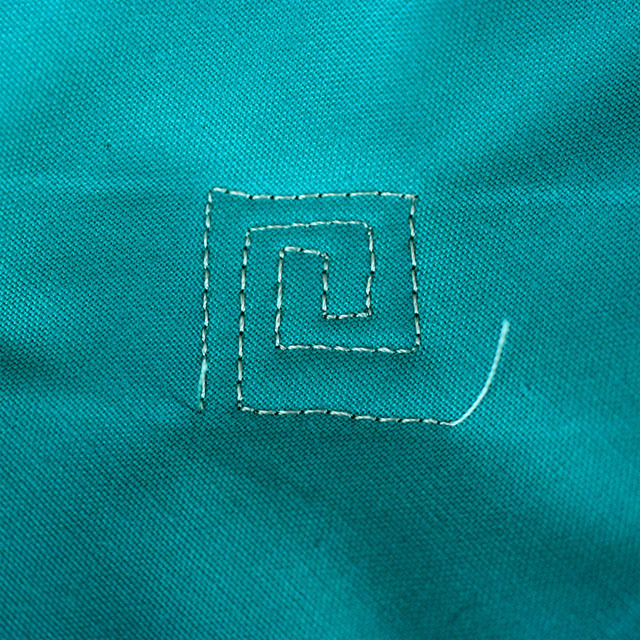 Now stitch it…UP, a few stitches to the right, DOWN, a few stitches to right, UP…. THE ESCAPE: Just follow “the path” out of the box..That’s it! You are ready to begin again. Opa!! and tomorrow is Work In Progress Wednesday—A Pincushion Tutorial—be there or be square! 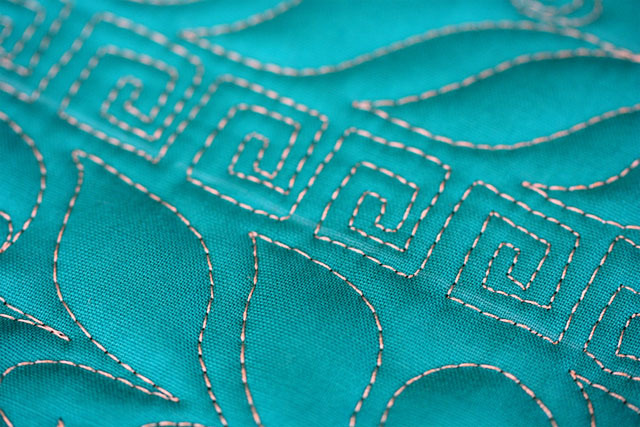 Love the color of the fabric! Makes me think of warm, ocean water! The lovely gulf coast variety for me :). Happy Tuesday. What kind of thread do you use? My thread keeps breaking and I am wondering if it might be the wrong kind. Thanks. 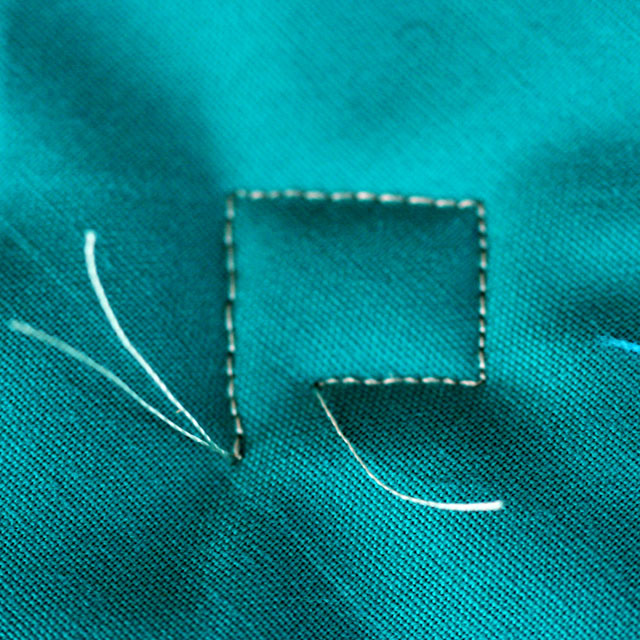 My current favorite threads are Aurifil–great for practice–it never breaks. I also love Sulky viscose–pictured in today’s post (large spool that I buy at JoAnns —with a coupon of course) and Isacord–from the sewing machine dealer. I use a size 80 universal (sometimes 70 universal) needle with all of those. 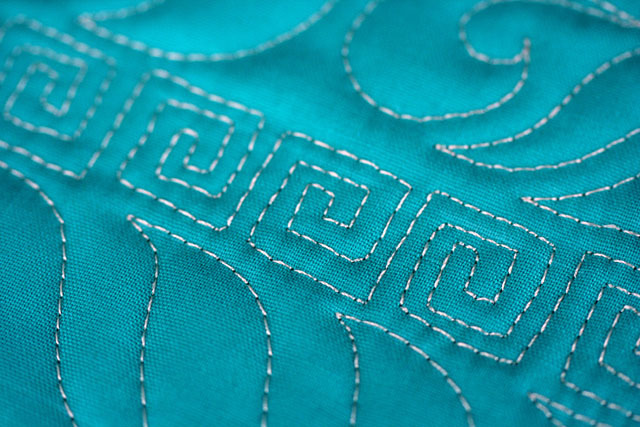 When I do have breakage—for my machine—it is usually a broken thread caught in my bobbin area… Let me know how that goes, I have some other ideas if not…Also, what kind of machine do you have? Thanks so much for the tips. I hope the thread will do the trick! Hmmm. Ok. I will play around with that. Thanks again! I really like how you have combined the designs with the geometric Greek key in the center with the free form leaves on the outside. It’s a nice contrast. Thanks–coming from you that means a lot! I’d be happy to look at your quilt. 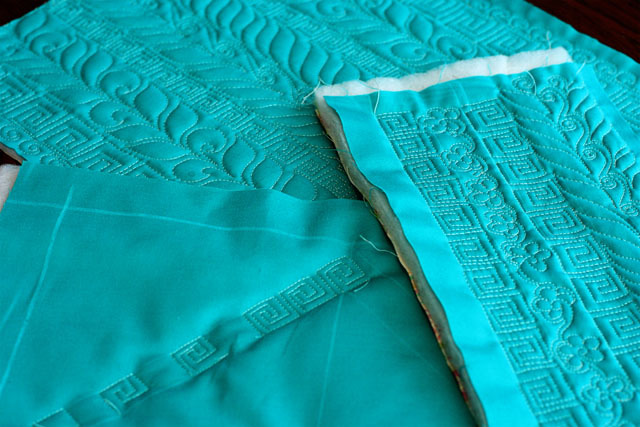 Can you send the direct to your quilt? 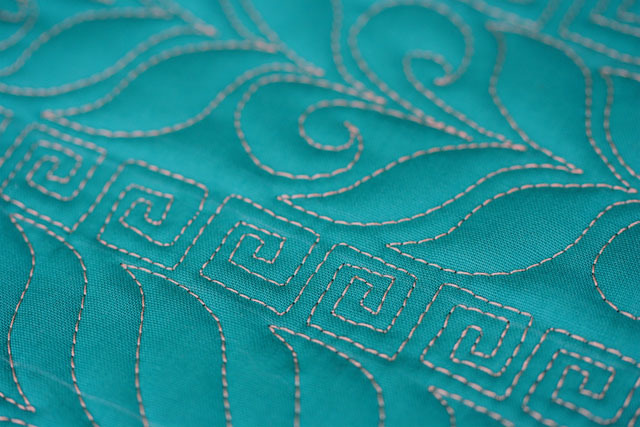 I absolutely love the idea of adding a Greek key-as a nod to the pattern on your wedding rings! Thank you so much! I’ll send you an email with a pic attached.